It, most likely, would not be an unreasonable assumption to believe that someone who is a diehard fan of the Mountain Goats and who has been following their music since the band’s humble beginnings in 1991, would not have a difficult time coming up with some sort of review for this newest installment – the band’s 15th studio album – “Beat the Champ.” Whether good, bad or somewhere in between, such devout attention paid to a group’s lengthy discography would certainly leave one with plenty to say, one way or the other. A lack of a relationship with the Mountain Goats’s legacy does not leave this album any less enjoyable. “Beat the Champ” is a record with a copious amount of character, containing more than enough layers on all sides, to generate fascination as a stand alone work. This background and inspirational context illuminated by Darnielle certainly provides the long time fans with plenty to mentally chew on; adding this newest coat of insight to the lineage of places Darnielle has been – mentally, physically, emotionally and spiritually – throughout the time that has elapsed alongside the Mountain Goats’ many albums. Thinking of “Beat the Champ” as a single entity however, and coming to understand and digest how this fantastical activity of wrestling stands in as a placeholder for what Darnielle explains is, “surprise surprise…really…about death and difficult-to-navigate interior spaces [more] than wrestling,” reveals an intriguing exploration to listeners. This journey, in the form of a record, manages to rather effortlessly present a neatly wrapped duality between the juvenile and the mature. It does so without feeling either like a laggard gimmick or contrarily, without trying excessively hard to be amusingly witty simply to meet some sense of a conceptual identity, manifested and upheld by fans of the Mountain Goats. 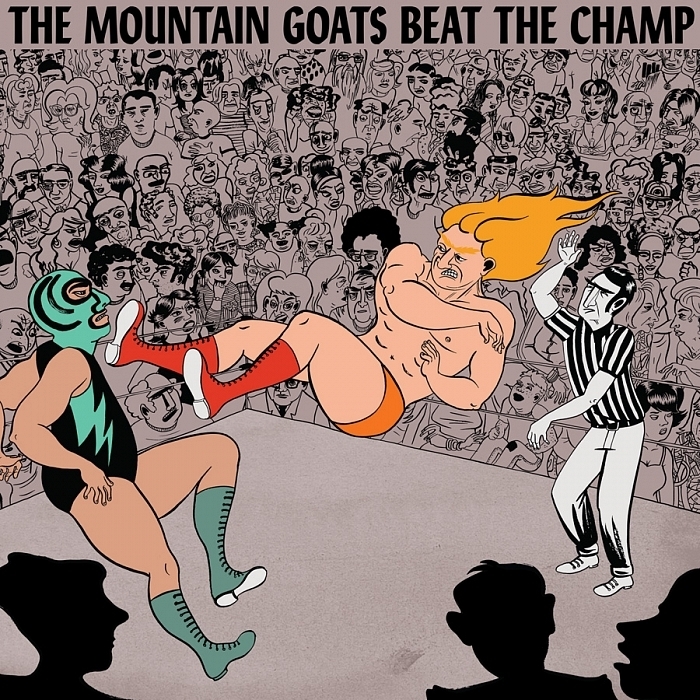 Venturing past face value and quote evaluation, the Mountain Goats’s musical decisions over the course of “Beat the Champ” present another pair of impressions, depending on how one processes the music. Played through as a whole, the album initially leaves the impression of a fluid bell curve –with its acme of sorts appearing between tracks eight (“Stabbed to Death…”) and nine (“Werewolf Gimmick”), even if the idea of the songs rising, peaking and then descending in intensity does not come to pass with a perfectly shaped predictability. Speaking more individually about the songs, a few different musical peers come to mind, who might not necessarily be individuals Goats fans think of in tandem with the indie folk trio, but, for an assortment of reasons, peek through on this record. The prominent incorporation of nicely polished and nimbly playful piano lines, often serving as the melodic rudder when featured, pull up a spotlight on an assortment of chapters in the saga of Ben Folds (Five). There are touches that remind of “Whatever & Ever Amen” (1997), “Of the Sound of the Life of the Mind” (2012) and even bits from “Rockin’ the Suburbs” (2001). Darnielle’s treatment of the piano, from the notes chosen, to their character of sound recorded to the album, parallels quite eloquently. Of course, even if the Mountain Goats never so much as consider the Great White Way, that does not mean their penchant for melody-propelled storytelling is any less clever, even if the stories are contained within a two to three-minute, as opposed to a two to three-hour, period. (Just ask author Nick Hornby and any of the musicians with whom he has collaborated.) In fact, while one can think of show tune type construction with “Beat the Champ,” the degree of compositional individualism spread over the 13 tracks keeps the record from fully embracing the level of interlocking connection that musical scores often exhibit. The jazz colored instrumental parts of “Fire Editorial” and the lengthy piano outro-solo of “Heel Turn 2,” for example, are what give “Beat the Champ” a great deal of its multi-layered personality. All in all, there are plenty of listening avenues one can choose to take when playing “Beat the Champ.” In this way, it’s a record that offers a good amount of replay value. Hear it as a brand new fan and have lots of react to for each of the 13 short stories about which Darnielle sings. Hear it as a loyal long timer and have those inevitable comparison-loaded discussions about the Mountain Goats’s evolution. Steadily catch oneself up with the Mountain Goats’ other albums alongside “Beat the Champ” and possibly find one’s first perception of their music changing with the gradual incorporation of more context. Place a new fan and an older fan in the same room and maybe share a mutual laugh over a single moment; (Nothing quite like cheerfully singing, “I’m gonna stab you in the eye with a foreign object.”) a piece of a song found humorous, absent any deeper analysis. The Mountain Goats balance infusion of the new, the familiar and their continuing curiosity, presenting an album that shows an awareness of just how long they have been around and how to adopt change with careful grace over abrupt impulsivity. “Beat the Champ” comes out via Merge Records on April 3 (Australia), April 7 (US and Canada) and April 13 (everywhere else). Stream it now via “First Listen” on NPR Music!